Emanuel Heilbronner was born in 1908 into a Jewish family whose soap making history dated back to 1858. He started a soap making apprenticeship in Southern Germany in the 1920’s and after being certified as a master soap maker, emigrated to America to flee the Nazi’s in 1929 (dropping the Heil from his name). In the 30’s, Bronner met his wife and had a daughter and two sons. His wife died a few years later which was when he started to put together something he called ‘a peace plan’. He was arrested at the University of Chicago in 1945 whilst trying to promote ‘Dr. Bronner’s Peace Plan’ and was committed to a mental institution where he received shock treatment. Despite this, he managed to escape 3 times before fleeing with only $20 and settling in LA in 1947. As a sideline, Bronner started making handmade peppermint soap at home. He also started lecturing at Pershing Square in LA which was described at the time as a “hotbed of activisim” – the perfect place to promote his peace plan. There he told others that there was a need “for the world to unite before it destroys itself and for all people to unite as one”. The problem was that people would turn up to the lectures and take the soap before they had heard him speak. His solution to the problem was to write his peace plan in very small writing onto the labels of his soap, which is still used on the labels today! 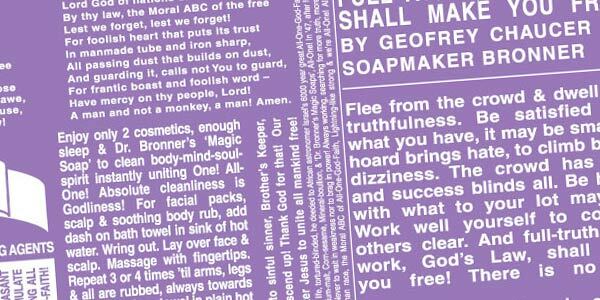 He continued to make the soap and labels at home which eventually developed into a small factory: founded as Dr. Bronner’s Magic Soaps in 1948. Dr. Bronner died in 1997, but the company continues to be run by his two sons. “Whereas Messrs, Proctor and Gamble dream (well, dreamt) of enzymes and long-chain fatty acids, Bronner dreams of world peace”. Over time, the product range has expanded to include other body and hair products under the name of ‘Dr. Bronner’s Magic’. Fair trade – Dr. Bronner’s was certified as a Fair Trade company in 2007 by Swiss certifier IMO. Cruelty free – No Dr. Bronner’s products or ingredients have been tested on animals. The classic liquid soap bottles are made from 100% Post-Consumer Recycled (PCR) Cylinder Bottles. Bottle labels are printed with hemp seed ink.